Max Greenfield came by to talk to Kelly & Michael. But first they showed another clip of Joan Rivers. They showed a clip of her and her daughter Melissa on the show. They said she was your dream guest. You didn’t have to say anything; she would just start talking and keep going. 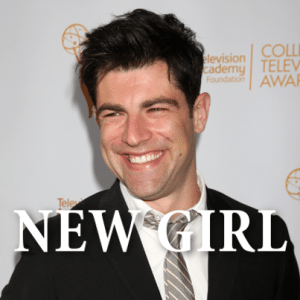 Max Greenfield plays the “lovable ladies man” Schmidt on New Girl. Michael called him very funny. He even danced a little when he came out. He said he’s a year older. He had a birthday last week. He said he thought that people were going to applaud but they didn’t (but then they did). He said how weird it was that people congratulate you on your birthday, and it wasn’t a significant birthday. He’s 35. He went to Mexico with his wife, which was their first adult vacation without the baby, but she’s not really a baby anymore. She’s four and a half. Kelly said he might have another baby, and he got really flustered. Last time he was on the show they talked about how obsessed with Frozen his daughter was. Michael asked if she finally “Let it Go.” She’s obsessed with hula hoops now. He didn’t think it was difficult, but it’s so hard. He thought it was just because he needed a bigger one, but he still couldn’t do it. People look like they’re barely moving. They had an expert on the show. His daughter did around 300 spins. Greenfield also recently rescued a dog named Murphy. It’s a Shih Tzu mix and he’s the best. Kelly said adopted dogs are appreciative because they know they were in the system. He loves to lick faces and he gets excited. New Girl is in its fourth season already. That was fast. They go to a wedding in the first episode and Greenfield loves weddings. He officiated his friend’s wedding. He had no idea that you could just go online and become a minister. He said it was a beautiful wedding, and he wrote his speech down. He didn’t use too many jokes though. It wasn’t the time. This season on New Girl will be “a lot more of the same.” They’ve shot four episodes and Jessica Biel is in their first episode. He said that the guys started acting differently and forgot their lines when she showed up. Reid Scott from Veep was also in the episode. They showed a clip of New Girl, and Schmidt was giving the group a pep talk for the wedding. This was the last wedding of the summer and was their last chance because “winter is coming” and nobody could come home alone. New Girl’s season premiere will be September 16 2014 on FOX.